British food doesn't have to be unhealthy and that's why the British Heart Foundation has produced this collection of everyday British recipes. British food doesn't have to be unhealthy and that's why the British Heart Foundation has produced this collection of everyday British recipes. We believe that eating healthily doesn't mean that you have to eat bland, boring food or give up those comforting, traditional meals that we all love. With a few tweaks here and there it''s amazing what difference you can make. Taste is important as there's more to healthy eating than just changing the foods you eat or the way you cook them. Enjoying your food is all part of healthy eating and however healthy a meal is, if it doesn't taste good then you won't eat it. That's why adapting recipes that the whole family knows and loves is so great and hopefully you will want to make these ones again and again. Then you can all enjoy your favourite meals together and know that they are healthy for young and old hearts alike. So, before you decide you've had your last cottage pie, sponge cake or roast dinner, think again. These British classics can still be on your menu everyday! 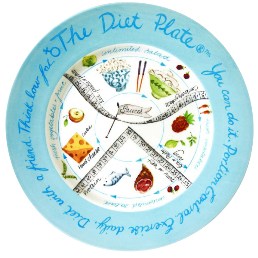 The attractive earthenware Diet Plate collection gives you a little help with your healthy eating plan and portion control.